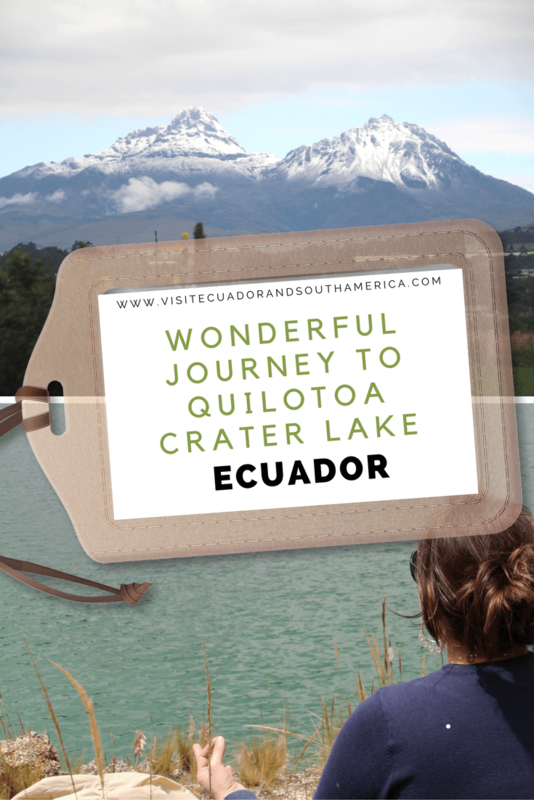 There is no doubt why visitors and tourists from all over the world have ranked Quilota crater lake as the top 1 attraction to visit in the province of Cotopaxi on Tripadvisor. Nestled in the middle of the Ecuadorian Andes, this crater lake is located no more than 3900 meters above sea level. From the main entrance you find a fantastic lookout point from where you can admire magnificent views of the gorgeous tones of electric turquoise and dark blue in the water that will render you speechless. I would just use the adage “A picture is worth a thousand words” to let you get inspired by the following picture that describe best this place. Depart from Quito, take the Panamerican Highway until you get to Latacunga, a 4 lane road. The trip will take about 1.5 hours. On the way you will pass the village of Pujilí, known for its clay crafts and paintings called Tigua. These use bright, bold colors in Naive style and are made of sheepskin, later framed in wood. Enjoy one of the monuments at the entrance to the city. Once you arrive to the town of Pujilí take the road west towards Zumbahua, past the police control, you get to a nice scenic area. In Zumbahua, we can find a gas station and local food like corn with cheese, fritada(fried pork), fried sweet plantain and others. Take the road to the right, before arriving to the gas station we arrive at Lake Quilotoa. Along the narrow and winding road we enjoyed have a typical Andean plateau landscape, which of course included sheep, llamas and other animals from the region. The best way to get there, is of course by car, but it is also possible to take 2 buses and that will make it pretty affordable. Prices of buses in Ecuador and in general in South America are rather cheap. So, if you are in Quito, you need to first take a bus to Latacunga, and from there take a second bus to Quilotoa that will take around 2 hours and will be no more than 5 USD (the last bus) If you are driving, then you first need to drive for a total of 4 hours from Quito through the South-Panamerican highway. Most of the road is paved, but there are still some 45 km left of work, just before the access to the lake. Another option is to take a taxi from any of these cities to the lake. By booking a tour to Quilotoa, you avoid the hassles of planning and getting there, money and time spent because getting to Quilotoa is not easy if you don´t have a car. So I suggest you book a tour here. Upon arriving at Quilotoa crater rim at 3,900 meters, we find the parking lots together with a handcraft store, several restaurants and simple but comfortable accommodation, with electricity and toilets. This beautiful lake was formed by the accumulation of water in the crater of the extinct volcano. It is usually light green, but depending on the sunlight it can turn blue. Along the inner slopes going down to the lake shore, you can see some yellow hues due to the straw and minerals in the soil. There is a lookout point at the top from where you can admire this beautiful lake and take pictures. On a clear day you can spot the Illinizas. The descent is of course part of the experience, and takes about 45 minutes. The descent has te be done carefully due to sandy volcanic soil along the way. The sunrays hit strong in the Andes cordillera, and specially in Ecuador. So, wear hats and sunglasses for sun protection, as well as gloves for the cold wind. Due the hight of the area, above 3,000 meters, there are strong winds which give greater feeling of cold in this area. I definitely recommend adding this amazing hike and pretty special natural lake to your places to visit while in Ecuador. Click here to admire more beautiful shots of Quilota crater lake.